Get familiar with the 5 types of IELTS essay questions. There are 5 types of IELTS essays but before you even start to think of ideas or begin writing your essay, the first thing you must do is analyse what type of question it is. This is a crucial step because if you do not analyse the question, or if you are unclear about anything, you could write a completely different essay. Let’s take a look at different types of questions. Don’t worry too much about the topic here, we are just going to identify what type of essays they are. I have underlined the key action words that indicate what type of question it is. Click on the links below for lessons on thinking of ideas, paraphrasing and thesis statements. Click here for a lesson on how to think of ideas for essays. For strategies and tips on paraphrasing the question click here. For a lesson on writing a good thesis statement click here. Take a look at these question types for IELTS essays, can you guess what type of essay it is? I have underlined the ‘Call to action’ or ‘instruction words’, these tell you what kind of essay it is and what to write about. 1. Today, the high sales of popular consumer goods reflect the power of advertising and not the real needs of the society in which they are sold. To what extent do you agree or disagree? Opinion essay : In this question it asks to what extent do you agree or disagree? this means ” how much do you agree or disagree? ” It means: do you completely agree? completely disagree? partly agree? neither agree nor disagree. You must give examples and explanations and the essay should ideally have 2 body paragraphs with your opinion in the introduction, main body and the conclusion. 2. Successful sports professionals can earn a great deal more money than people in other important professions. Some people think this is fully justified while others think it is unfair. Discuss both these views and give your own opinion. Discussion and opinion essay: you need to discuss both views in the question and give your own opinion. So you need 2 body paragraphs with each point of view and examples with details and opinion. You can also have a third body paragraph with your own specific opinion. Your opinion should also be in the introduction too. 3. As most people spend a major part of their adult life at work, job satisfaction is an important element of individual well-being. What factors contribute to job satisfaction? How realistic is the expectation of job satisfaction for all workers? Two part or double question essay: In main body one you would write about the factors that make up job satisfaction. In main body two it is asking your opinion, so you would write your opinion about whether it is realistic that everyone can expect to be happy in their jobs, in my view, this is not realistic, so I would state that as my opinion and explain why I hold that view. 4. Some people think that universities should provide graduates with the knowledge and skills needed in the workplace. Others think that the true function of a university should be to give access to knowledge for its own sake. In your opinion what should be the main function of a university? 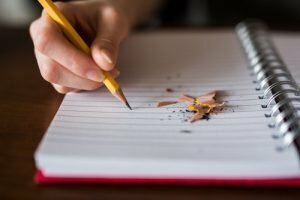 Opinion Essay: The introduction must paraphrase the question and include your opinion , in the thesis statement. There should be 2 body paragraphs giving examples and details with your opinion again and a conclusion summarizing your main points. 5. In some countries, the average weight of people is increasing and their levels of health and fitness are decreasing. What are the causes of these problems and what measures could be taken to solve them? Problem Solution essay: You need to give examples of the causes of the problem in the first body paragraph and possible solutions in the second body paragraph, also note that you do not have to give a direct opinion but mainly a recommendation of some kind so as to solve the problem. 6. Some experts believe that it is better for children to begin learning a foreign language at primary school rather than secondary school. Do the advantages of this outweigh the disadvantages? Advantages disadvantages essay: the keyword here is ‘outweigh’ it means are the advantages stronger than the disadvantages?. Body paragraph 1 should focus on an advantage and body paragraph 2 should focus on a disadvantage with explanations and examples. This is a special type of advantage Disadvantage essay, it actually asks for your opinion here. You must write what you think is stronger, the advantage or disadvantage?, The whole essay will reflect your opinion. 7. Some people think a crime should always have a fixed punishment like life for murder, while others believe you should take the circumstances of the crime into account. Discuss both views. Discussion essay, the hint here is: “Some people think… while others believe”.. and also “Discuss both views”…These are the keywords that show it is a discussion essay. Many say…… whereas others think….. Some say …….whereas others argue…. 8. In recent times, more people prefer to communicate via messaging apps and email instead of face to face. Why do you think this is? When is face to face to face communication necessary? Two part or double question essay: This question is asking for a direct opinion the words ‘Do you think..’ means it wants your opinion. You need to answer the first question in body paragraph 1, explain the issue and give examples of it , then answer the second question in body paragraph 2. The conclusion is just a short summary of your key points with your opinion again.